Katia is exploding. It has to be at least 125 mph and probably more like 135 mph. The hurricane center only increased the winds by 5 mph to my surprise. The hurricane is much more organzied and the eyewall has strenghtened markedly today. The northside still is a little weak. Despite this, a well defined eye, increased upper outflow and colder cloud tops point to Katia as being a major hurricane. No official readings are possible as no hurricane hunter recons have investigated. The wind of 107 mph was from a buoy at 9 am - during the first half of the strengthening phase. 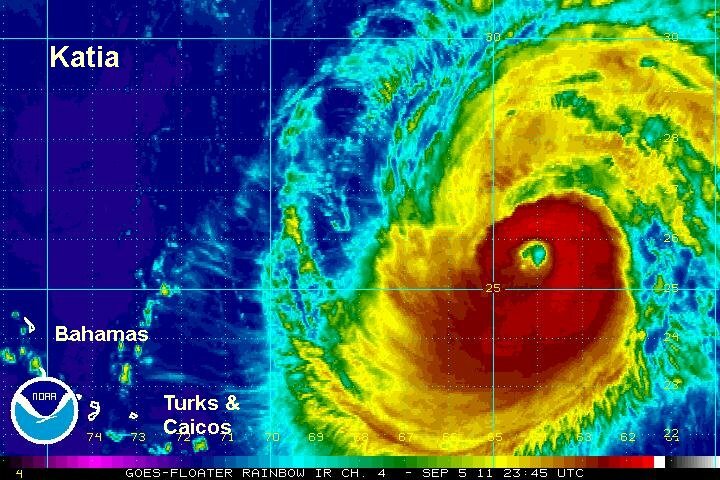 At 7 pm edt / ast Katia was centered at 23.0 N / 60.4 W or about 370 miles nne of St. Martin. Top sustained surface winds 125 mph (NHC 105 mph last advisory). Movement nw at 12 mph. Pressure estimated at 965 mb. Kaita injested dry air overnight which greatly disturbed the circulaton. A new, much larger eye has formed this morning. The net result, significant weakening last night, but now a rebound. I suspect that top sustained winds collapsed from about 125 mph to under 100 mph last night. The eyewall is much larger and I believe that Katia will become an even stronger hurricane today. 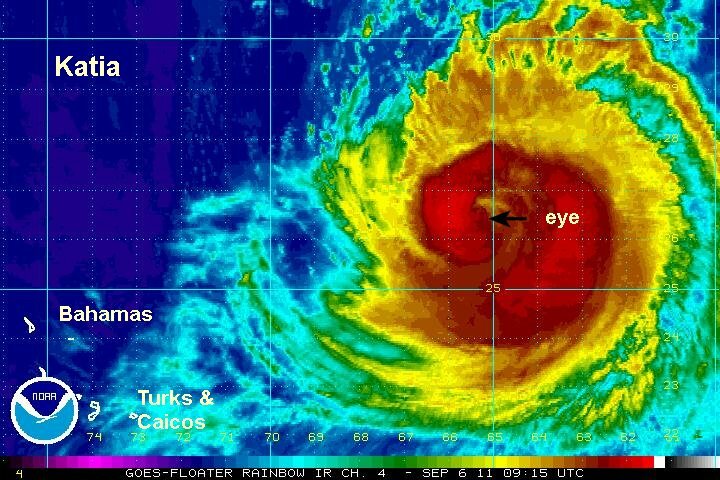 The eye has become well defined over the past few hours again and it looks like Katia is moving more wnw again. The hurricane center still has nw, but it was difficult for them to estimate the direction of motion with the eye reforming. We both once again has very similar strength estimates. At 7 am edt / ast Katia was centered at 24.2 N / 62.7 W or about 570 miles ene of Grand Turk / 575 miles sse of Bermuda / 1080 miles se of Cape Hatteras, North Carolina. Top sustained surface winds 105 mph (NHC 100 mph last advisory). Movement wnw at 12 mph. Pressure estimated at 972 mb. The forecast shows Katia strengthening and moving in the general direction of the Mid-Atlantic coast east of North Carolina. models recurve it to the north roughly a couple of hundred miles east of Cape Hatteras and staying offshore of the Northeast U.S. coast. 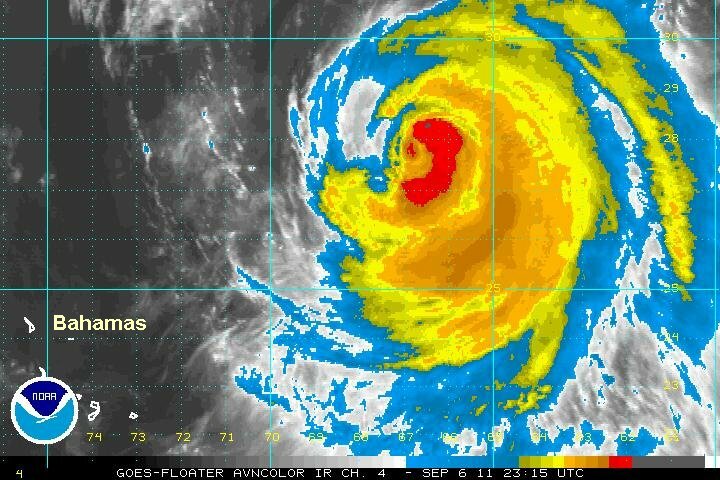 Katia has reorganized and has a large eye of approximately 40 miles in diameter. The eyewall is becoming very thick and further strengthening is likely. 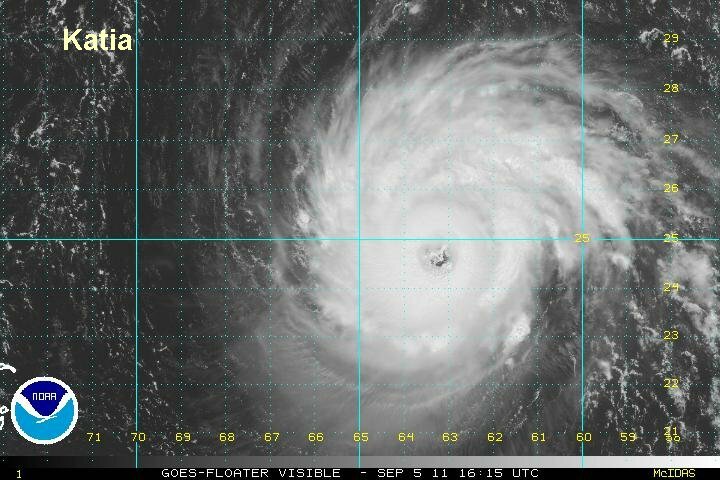 Katia is again a major hurricane (unofficially). At 2 pm edt / ast Katia was centered at 24.8 N / 63.5 W or about 540 miles ene of Grand Turk / 525 miles south of Bermuda / 1015 miles se of Cape Hatteras, North Carolina. Top sustained surface winds 125 mph (NHC 110 mph last advisory). Movement nw at 13 mph. Pressure estimated at 960 mb. The eyewall has increased since this afternoon around Katia which indicates strengthening. Satellite estimates of wind speed place the strength between 125-140 mph and pressure between 949-942 mb. Both of these estimates are considerably above the hurricane center's estimate from earlier. NHC will likely continue their methodical strengthening on the next advisory. At 9 pm edt / ast Katia was centered at 25.8 N / 64.1 W or about 540 miles ne of Grand Turk / 450 miles south of Bermuda / 940 miles se of Cape Hatteras, North Carolina. Top sustained surface winds 130 mph (NHC 115 mph last advisory). Movement nw at 13 mph. Pressure estimated at 951 mb. Interests on the U.S. east coast from South Carolina northward and eastern Canada should keep an eye on Katia's track. Remember that long range forecasts can have large errors. Strong rip currents on the U.S. east coast and Bermuda are the primary concern at this time. Katia's circulation took in a little dry air overnight. The eye is also being obscured by high clouds. Because of this I am estimating a little lower wind speed. The estimate is now inline with the hurricane center's wind estimate. This cat and mouse game will likely continue for another day or two with the dry air. This will allow for strengthening and weakening phases. Once Katia starts turning north in a day or two it will pick up forward speed. Winds will start to fall off as wind shear picks up. A buoy about 165 miles to the northeast of the center has reported 50 mph winds and seas up to 25 feet. NOAA estimates that seas are 40 feet near the eyewall. At 7 am edt / ast Katia was centered at 26.6 N / 65.3 W or about 515 miles ne of Grand Turk / 400 miles south of Bermuda / 850 miles se of Cape Hatteras, North Carolina. Top sustained surface winds 125 mph (NHC 125 mph last advisory). Movement nw at 13 mph. Pressure estimated at 950 mb. 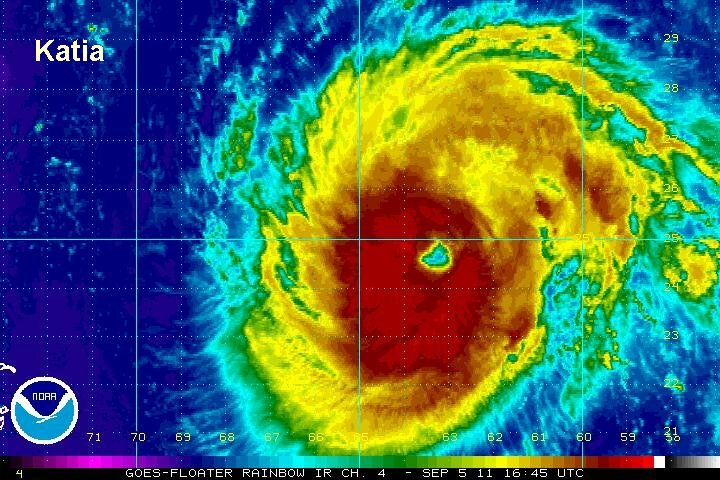 The dry air ingested into the circulation about 24 hours ago has taken a toll on Katia. The strength is considerably lower and the eye is no longer distinct. Despite this, Katia's windfield is large and has gererated large waves. NOAA estimates seas at 44 feet. Bermuda can expect large waves on the southern and western shores. At 8 pm edt / ast Katia was centered at 27.8 N / 66.9 W or about 515 miles ne of Grand Turk / 335 miles ssw of Bermuda / 725 miles se of Cape Hatteras, North Carolina. Top sustained surface winds 100 mph (NHC 105 mph last advisory). Movement nw at 10 mph. Pressure estimated at 963 mb. The forecast shows Katia moving in the general direction of the Mid-Atlantic well east of North Carolina. Models recurve it to the north roughly 250-300 miles east of Cape Hatteras and staying offshore of the Northeast U.S. coast. At 8 am edt / ast Katia was centered at 28.9 N / 68.1 W or about 315 miles sw of Bermuda / 615 miles se of Cape Hatteras, North Carolina. Top sustained surface winds 85 mph (NHC 90 mph last advisory). Movement nw at 10 mph. Pressure estimated at 973 mb. 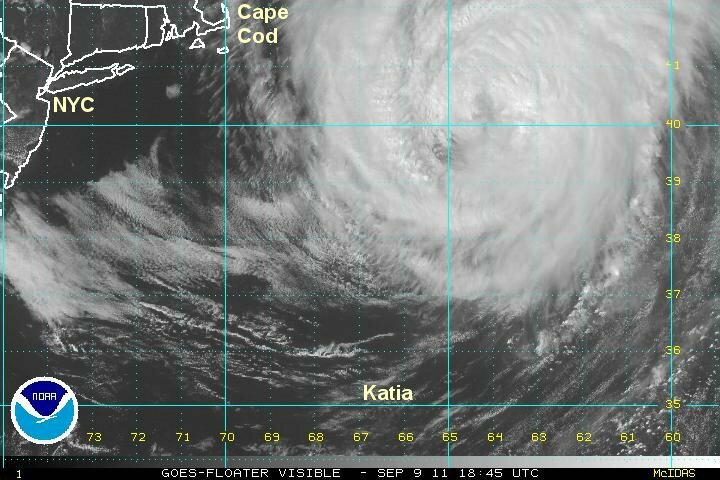 The forecast shows Katia moving about half way between Bermuda and Cape Hatteras the next day and a half. Models then recurve it to the northeast - well east of New England and south of eastern Canada. Interests in eastern Canada should keep an eye on Katia's track. Remember that long range forecasts can have large errors. Strong rip currents and large swell on the U.S. east coast and Bermuda are the primary concerns at this time. Katia remains a minimal hurricane and has starting turning more north northwest over the past few hours. The hurricane center has been dropping winds also today. The water vapor imagery shows dry air to the west as well as wind shear on the western side of the circulation. Despite this, a well defined eyewall is intact. Because of this I am leaving winds at 85 mph for this update. At 4 pm edt / ast Katia was centered at 29.8 N / 69.1 W or about 315 miles sw of Bermuda / 530 miles se of Cape Hatteras, North Carolina. Top sustained surface winds 85 mph (NHC 85 mph last advisory). Movement nnw at 10 mph. Pressure estimated at 976 mb. 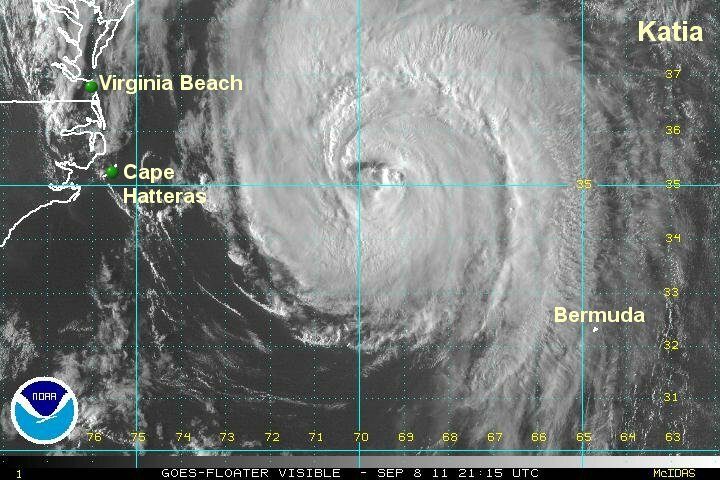 The forecast shows Katia moving about half way between Bermuda and Cape Hatteras the next day and a half. Models then recurve it to the northeast - well east of New England and south of eastern Canada. Transatlantic cruises will have to navigate the swell from a post tropical hurricane or north atlantic gale. Katia's appearance on satellite is starting to look like it is starting to transition into an extratropical cyclone with convection starting to spread from the center. Katia is still powerful. A buoy roughly 150 miles west of Bermuda recorded a wave height of 40 feet and winds sustained at 78 mph with a gust to 107 mph. For some reason NHC - I guess to be on the safe side - decided to "up" their winds to 90 mph. I'm keeping my estimate the same from last night, going with what the buoy reported and slightly over. At 7 am edt / ast Katia was centered at 30.3 N / 70.1 W or about 315 miles west of Bermuda / 530 miles se of Cape Hatteras, North Carolina. Top sustained surface winds 85 mph (NHC 90 mph last advisory). Movement north at 14 mph. Pressure estimated at 970 mb. 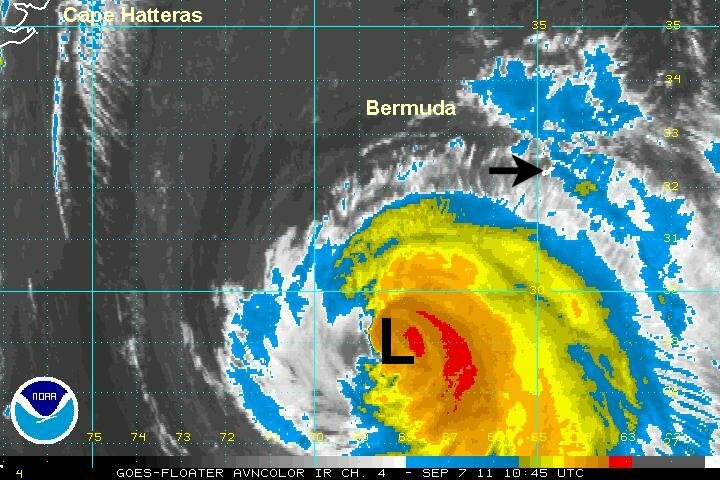 The forecast shows Katia moving about half way between Bermuda and Cape Hatteras later today. Models then recurve it to the northeast - well east of New England and south of eastern Canada. Transatlantic cruises will have to navigate the swell from a post tropical hurricane or north atlantic gale. Interests in eastern Canada should keep an eye on Katia's track. Remember that long range forecasts can have large errors. Strong rip currents and large swell on the U.S. east coast and Bermuda are the primary concerns. Katia retaining the classic hurricane look and moving north - well east of the US east coast. I post a full update later this afternoon / evening. 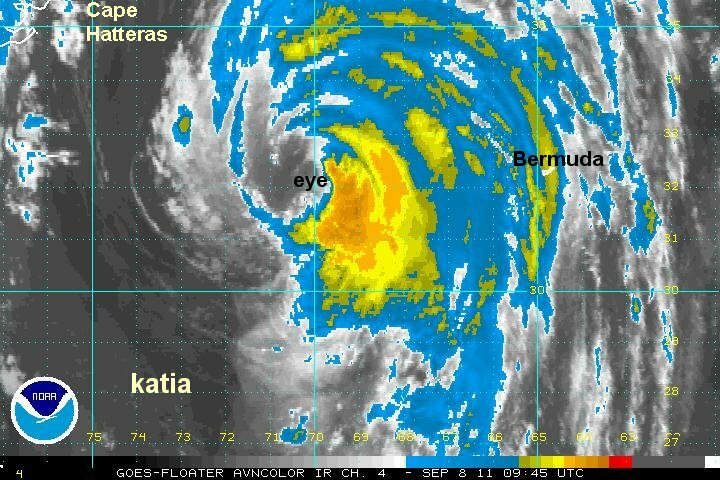 Katia has a very large eye as it passes roughly half-way between Bermuda and Cape Hatteras, NC. It is starting to turn nne form the last couple of visible satellite images. The hurricane center is showing northerly motion, but nne is now more representative. 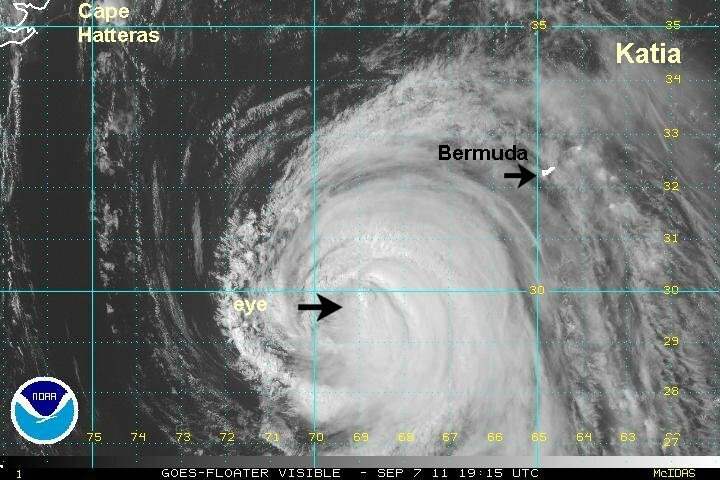 At 5 pm edt / ast Katia was centered at 34.9 N / 69.6 W or about 330 miles northwest of Bermuda. Top sustained surface winds 85 mph (NHC 85 mph last advisory). Movement nne at 14 mph. Pressure estimated at 973 mb. Katia is starting to recurve out from the U.S. east coast . It should be well east of New England and south of eastern Canada. Transatlantic cruises will have to navigate the swell from a post tropical hurricane or north atlantic gale. Katia is recurving east of New England today and moving on out headed toward the northern north Atlantic ocean. It is starting to lose tropical characteristics as convection spreads away from the center and the eye grows even more massive. Swell will continue to be higher today on the U.S. mid-atlantic and northeast coast but should start subsiding after today. At 7 am edt / ast Katia was centered at 37.7 N / 65.3 W or about 500 miles south southwest of Halifax, N.S.. Top sustained surface winds 85 mph (NHC 85 mph last advisory). Movement ne at 24 mph. Pressure estimated at 967 mb. Katia is recurving from the U.S. east coast . It is moving well east of New England and south of eastern Canada the next day and a half. Transatlantic cruises will have to navigate the swell from a post tropical hurricane or north atlantic gale. 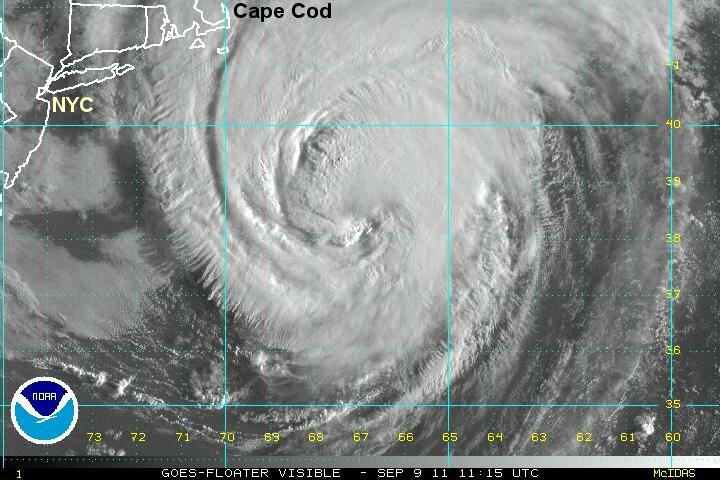 Katia is becoming extratropical as it races away from New England and south of Canada. It will be heading across the northern north Atlantic over the next few days. 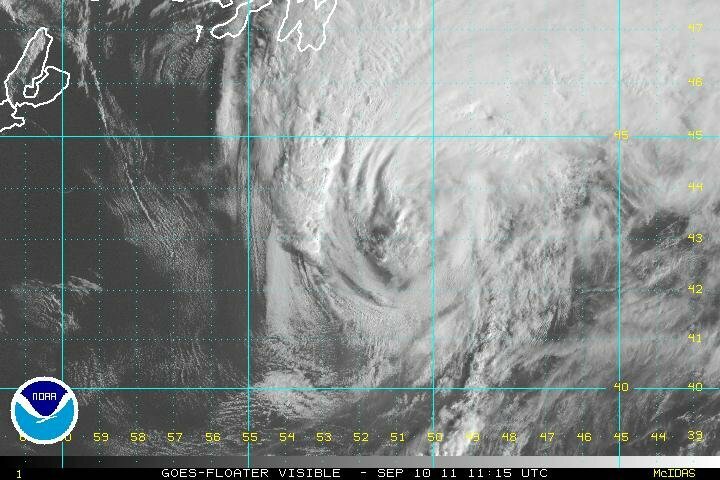 At 4 pm edt / ast Katia was centered at 40.1 N / 64.0 W or about 330 miles south of Halifax, N.S.. Top sustained surface winds 80 mph (NHC 85 mph last advisory). Movement ne at 29 mph. Pressure estimated at 968 mb. Katia is recurving from the U.S. east coast. It is moving well east of New England and south of eastern Canada the next day and a half. Transatlantic cruises will have to navigate the swell from a post tropical hurricane or north atlantic gale. This will be the last update on Katia. This is the last look at Katia. It is now moving toward the northern British Isles where it will arrive in several days.